Anti-gas tax leader Carl DeMaio on Wednesday accused Caltrans and one of its contractors of handing out campaign literature opposing Proposition 6 in violation of state law. “Caltrans as well as its contractor have all violated state law,” DeMaio said at a press conference in Escondido. DeMaio released photos of the incident, which occurred Tuesday on state Route 78 between Ramona and Julian during construction work. 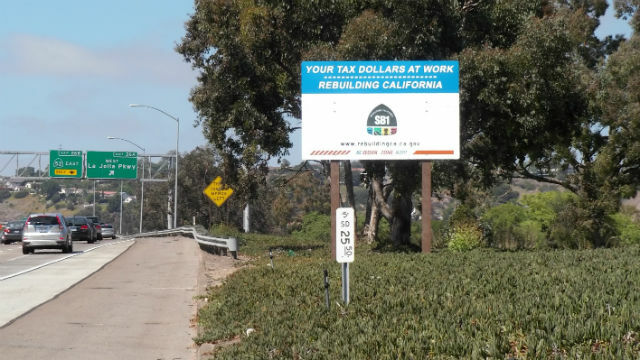 In addition, DeMaio and supporters filed a criminal complaint against Caltrans. Proposition 6 seeks to repeal Senate Bill 1, which increased the tax on gasoline and diesel fuel to fund road repairs throughout California. The Yes on 6 campaign announced the filing of an ethics complaint with the San Diego County District Attorney’s Office, the California Highway Patrol and the California Fair Political Practices Commission. “In my 25 years of political involvement, I never thought I would have to do a press conference like the one I just did showing evidence of a state government agency wantonly using taxpayer funds to advance a position on a ballot measure,” DeMaio said. Caltrans Director Laurie Berman said the agency is looking into the workers’ actions. The Yes on 6 campaign alleges the distribution broke a state law prohibiting state and local employees from using public resources for campaign activity and that stopping traffic broke a state law prohibiting the impediment of “normal and reasonable movement” unless it is necessary to do so. Yes on 6 also alleges the No on 6 campaign violated the state Political Reform Act by providing campaign materials to publicly-funded workers and by failing to disclose the value of the “contribution” made by campaigning.